The opulent Gilded Age banquets that characterized the Grant White House were but a distant memory when James Garfield, a farmer’s son, moved into the White House in 1881. But his days there were limited. 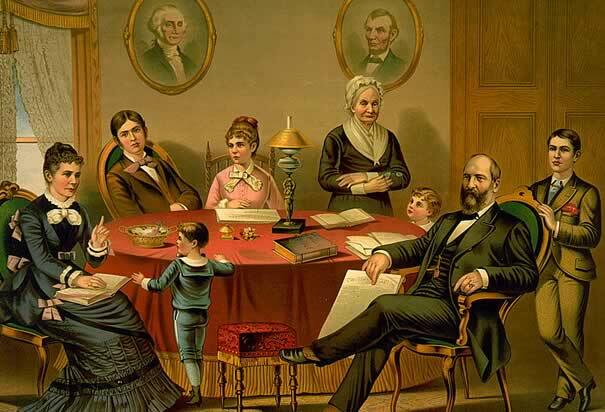 For two months, Garfield suffered in the sweltering heat of Washington D.C. unable to consume anything more than soup and milk, and when he died on September 19th, the nation went into a state of mourning that reportedly surpassed that accorded to Lincoln. Although Garfield wasn't president for a long enough period of time to leave any lasting culinary stamp on the White House, historians say that he preferred healthy nutritious food over the rich European dishes typically served by White House cooks. It has also been said that Garfield was particularly fond of squirrel soup and that his favorite drink was milk, so much so that, as he was dying, "the Adams Express Company in Baltimore sent a cow to the White House to ensure a fresh supply of milk." FAST FACT: Garfield's death resulted in three presidents assuming office in one year (Rutherford B. Hayes, Garfield, and Chester Arthur). This has happened one only one other occasion in our nation's history. In 1841, William Henry Harrison succeeded Martin Van Buren but died one month later and John Tyler became president.